This is a guest post by the Rev’d Stephen Heard – Assistant Priest at St Mark’s Church, Enfield. 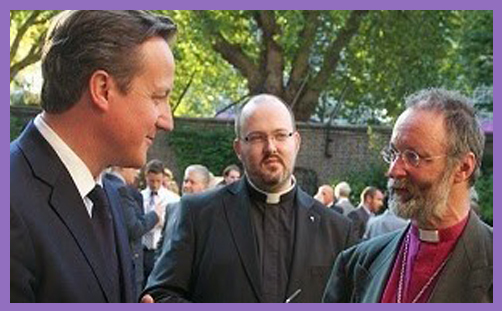 He is a former civil servant with a background in political and media relations, and was Parliamentary Chaplain to the Bishop of London 2007-2013. He tweets at @seheard and is author of the Unheard Melodies blog. “The mood of Church of England bishops judging by Twitter was, by and large, glum.” So reported the Church Times post election. To be fair, this overall glumness of mood was inferred from the responses of the small handful who felt moved to comment publicly on the outcome. Among them was the Bishop of Sheffield, who blogged a personal sermon to the Prime Minister, urging him to “read and ponder” the lessons about accepting and weighing advice in the story of Rehoboam in 1Kings 12. The moral of the story – that the new King should reach out to his father’s enemies, rather than punish them for their opposition – will not have been lost on the Prime Minister, were there but the smallest chance that he had read the Bishop’s blog and had a few moments to ponder its import. He almost certainly – predictably – will not have done so; and we realise that the sermon is really for us, the voters. We are the ones who, rather surprisingly (one imagines a raised episcopal eyebrow) have returned him to power, and whose duty it is to keep up the pressure on him – to “listen to all the people, to lighten burdens, and to build one nation, for the benefit of all”. This is advice so unexceptionable that I’m sure the Bishop would have offered it in the same spirit if Ed Miliband had squeezed into No.10, as predicted. The Bishop of Leeds wondered rather gloomily if what we have “settled for” is “a market society (as opposed to a market economy)”. For “if we have, we are stuffed”. I take “stuffed” in this context to be synonymous with “doomed”, pace Private Frazer in ‘Dad’s Army’. I never argue with bishops, but I doubt we are doomed. In similar mood, the Bishop of Chelmsford tweeted: “All manner of things may not be quite as well as some of us hoped” – respectful, evidently, of the many others for whom things had turned out better than they could have dreamed. The Bishop of Sodor & Man confined his comments to the need for a change to the voting system, which I imagine he has called for at previous elections. Now I daresay that these few responses do not capture the feelings of all CofE bishops, some of whom may even have voted Conservative. But they throw an interesting light on the Church’s ability to step up to the plate and take on the mantle of semi-official Opposition, now that the LibDems have a much smaller voice in Parliament and while Labour is preoccupied with appointing a new leader. This is a call made persuasively by Gillan Scott, who wants the Church to provide “a level of external conscience watching over the new Conservative Government”. We have to consider how well-equipped the Church is to fulfil this unexpected calling (presumably the ‘conscience’ bit would have been less demanding if Labour had won) and how likely it is to be able influence Government policy and behaviour. After the 2010 election, things looked modestly bright for a new relationship between Government and Church. Coalition ministers were not encumbered by New Labour’s allergy to ‘doing God’; some of them were unapologetic Christians, naturally attuned to the pastoral work that the churches do in ordinary communities, and keen to recognise their role in the big society. They dared to hope that the Church did not hate them as they had feared. Bridges were tentatively built. It is difficult to overstate how hard this tender shoot was frosted by the remarks of the then Archbishop of Canterbury, Rowan Williams, in his editorial in the New Statesman published on 9 June 2011. Under the headline ‘The government needs to know how afraid people are‘, Archbishop Rowan complained about “radical, long-term policies for which no-one voted”. It was by no means an unreasoned attack, but it did appear to come out of nowhere, and ministers were genuinely wounded by it. They felt they were doing a difficult job (rescuing a comprehensively crashed economy) under difficult circumstances (a coalition between parties which by nature had little in common) and making a reasonable fist of it. But the damage was done. The temperature dropped a few crucial degrees, and it was back to business as usual: bishops and other Church leaders writing open letters critical of government policy to national newspapers, making other public interventions in the same vein, and then in the run-up to the 2015 General Election issuing a report that was widely received as endorsing Labour (including by Labour itself). This is how the Church does politics these days, and it is, as we see, largely ineffective. When you want to influence someone, it is generally a good a idea not to start by publicly attacking them. You embarrass them, force them on to the defensive, give comfort to their critics, and make them less likely to listen to you next time. And in the political context, if you keep doing it, you become just another reliably hostile voice among many. You generally achieve little. A good deal of the work that is done in Parliament is done not in its debating chambers, but in its corridors, tea-rooms and bars. The people who make and implement policy and those elected and appointed to hold them to account are often enough under the same roof, and they are allowed to speak to each other. “A word in your ear, Minister?” is a perfectly proper way of bringing a concern to the person who has responsibility for the policy that relates to it, and is likely to be better received than a letter to the Times (or even a letter to the person). By means of face-to-face contacts, relationships can be built and a measure of trust established. The Church of England is unique in having bishops in Parliament: they walk the same corridors as government ministers – who generally do not bite. Fewer speeches, open letters and hostile blogs, and more conversations – this is the surest route to influencing policy. To jaw-jaw is always better than to war-war, even between bishops and Tories. We wait to see whether this is a plate the Church can step up to, and whether the lesson of Rehoboam is one it, too, can hear.